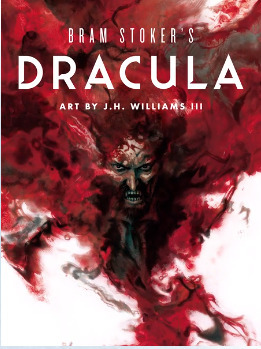 Now, Bram Stoker’s Dracula—the pinnacle of Gothic horror for generations—rises again with hauntingly dramatic digital artwork from two-time Eisner Award winner J.H. Williams III. When young English lawyer Jonathan Harker arrives in Transylvania on the eve of Saint George’s Day, he cannot shake a strange feeling of uneasiness. Dogs howl throughout the night, villagers speak Now, Bram Stoker’s Dracula—the pinnacle of Gothic horror for generations—rises again with hauntingly dramatic digital artwork from two-time Eisner Award winner J.H. Williams III. When young English lawyer Jonathan Harker arrives in Transylvania on the eve of Saint George’s Day, he cannot shake a strange feeling of uneasiness. Dogs howl throughout the night, villagers speak fearfully of evil omens, and the air grows colder as he arrives at his destination: the castle of Count Dracula. Jonathan has been summoned by the count for business, and while he finds his new host obliging and polite, he can’t help but notice the man’s pallid skin, odd lack of appetite, and long daytime absences. Puzzled, the young solicitor begins to search the castle for clues—and unearths a deadly secret that could endanger him and those he loves most. Journey through the Carpathian Mountains, lose yourself in the shadowy streets of London, and experience all the action, suspense, and terror of this classic tale. Just be sure to leave a light on.